A car is a major purchase, whether it's new or used. But every purchase can have its problems and none more so than buying a previously-owned vehicle. It's a market that's wide open to scammers - statistics show that used car buyers have a one in three chance of buying a vehicle that's subject to fraud. But with some care you can avoid them and find the car of your dreams. Selling a car that's been repaired after an accident. The frame might be bent then re-straightened, or any number of faults could be covered. Obviously, they're not about to tell you - they simply want to sell the car. Buy it and you could be riding a death trap. Selling stolen vehicles. Only two-thirds of cars stolen each year are recovered. 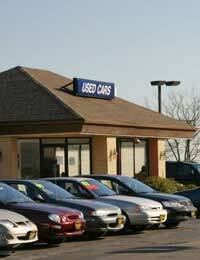 Many stolen cars are re-sold. If you've bought one and the police find it, they'll take it. In theory you can pursue the seller for your money - but what are the odds of finding him? Selling a car that's not paid for yet. If you knew about the debt, then the finance company can take the car from you. You can keep it if you didn't know - but how do you prove it? Make sure the seller can produce all the proper documentation, and that the car has a VIN number (you'll usually find it in the engine compartment and also the bodywork). Remember that cars more than three years old must have MOT certificates. Check it, and compare the mileage with the odometer. Always ask to see a seller's proof of identity. If it's a private sale, look at their insurance policy. Find out about the vehicle's history before you buy. The AA or the HPI can tell you. Have the vehicle checked. If you belong to a motoring organisation, they'll do that for a fee, or you can bring in your own mechanic. Never buy from anyone who's selling a car in a motorway service area - that's asking for trouble. If possible, go to the seller's house. Watch out for ads where dealers pretend to be private sellers. Not only are they trying to dodge some legal obligations, it's probably a car they can't sell otherwise. Is the vehicle "as described"? That, unfortunately, is the limit of your legal protection in a private sale. If the car isn't as described, you can sue the seller - which is why it's good to know his address. Beware, though: If you buy a car that breaks down the minute you get it home, you might be stuck - unless for instance, the owner claimed it had just passed its MOT when it quite clearly would have failed. Try and resolve any problems directly with the seller. If you can't and it's a private sale, you can sue in County Court. If the amount of the sale is less than £5,000, use small claims court. If the amount is higher, consider independent arbitration - most motoring organisations offer it. If you bought the car from a dealer, you can contact the appropriate trade associations - find out which he belongs to. Or you can contact Trading Standards.